You will look more rested and more youthful in appearance. Many patients report increased self-confidence after their eyelift surgery as friends and relatives comment that they look “younger” and “more refreshed”. Upper Bleph patients report being able to see more easily as there is no upper eyelid skin resting on their eyes and reducing their vision. I’m thrilled with the results – it’s a really brilliant procedure but surgery is surgery and so I had to go to someone I trusted and Consultant Mr Lambe is very skilled and experienced. It has massively boosted my confidence and I am really pleased with the results. Here’s Dawn Ward’s quotes and before and after photos in OK Magazine. Read more on her Blepharoplasty surgery here. Upper Blepharoplasty is the medical name for the operation to remove excess skin on the upper eyelids which lead to a hooded appearance on the eyelifts as the excess skin rests on the lid, sometimes resting on the eyelashes and sometimes lowering the skin over the eye which can reduce vision. I recently operated on a 52 year old teacher called Patricia who had been getting increasingly troubled by the appearance of her upper eyes. She was constantly hearing people tell her that she looked tired and drawn. She was also having increasing trouble when applying her eyeshadow. She was having to lift up the skin to apply the eyeshadow but once the lid fell back down it was covering all the makeup and her eyelashes! She had 3 sisters and they had all had the procedure done. The family have a history of developing heavy eyes as their Mum had always had very heavy lids and so it was something they were all keen to correct if possible. On her first consultation she explained all the concerns she was having and I asked her about her general health and any habits like smoking and medications and any previous operations on her eyes or problems with dry eyes. She had not had any problems like that and was keen to have her surgery while awake (local anaesthesia sometimes referred to as under LA). I had a careful look at her eyes to see if it was just excess skin or perhaps her brow had fallen. 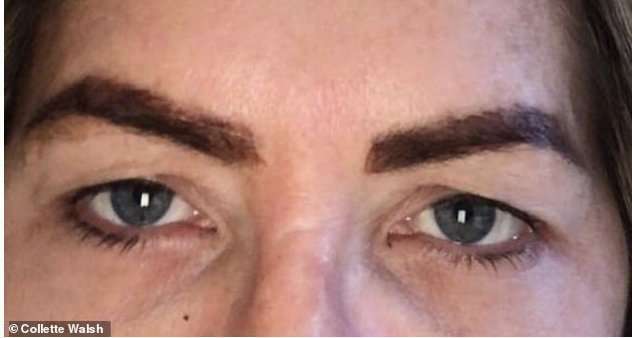 This a really important thing to look for because if a patient has saggy eyebrows it can look like they have extra skin on their upper lids but if that skin is removed the brow just falls even further so in this case the right treatment would be to lift the brow itself up. I tested Patricia for this though and confirmed that it was extra skin and not her brow. Another important little test is to look for any bulges of fat in the upper eyelids especially in the corner of these and this is done by closing the eye and gently pressing on it to see if any fat bulges come forward. Patricia didn’t have any problems with this either so my diagnosis confirmed it was just her skin and she was a good candidate for Upper Blepharoplasty surgery. I explained that in her case her upper eyelift could be done under General Anaesthetic (whilst asleep in theatre) or awake (under Local Anaesthetic whilst having pain reducing numbing treatment) and how the operation could be done in 45 mins. She opted to have her cosmetic surgery while she was awake which would reduce the time she was in hospital and could go back home to recover. She was told that the stitches would be removed in 5 – 7 days after the surgery. I also always warn my patients that sometimes there can be quite spectacular bruising and/or swelling but don’t worry too much about this as it tends to settle very quickly. The operation was scheduled for 2 weeks later. On the day I marked Patricia up while sitting up on the ward as I find this really allows me to carefully tailor my incision as each patient is different. She was then positioned comfortably on the operating table and I started by double checking the marking to make sure that just enough skin was to be removed and then started the injections. I like to take my time doing this as It can be frightening to have injections around the eyes. I put the first blog of Local in and then like to gently massage it across the eye so that any other injections are then more comfortable for my patient. I then carefully make the incisions using a small needle device that seals the blood vessels as it goes along. This helps to reduce bruising post-operatively. Then the wound is very carefully repaired with a fine running stitch and little tips are pleased at each end to prevent it from being accidentally pulled out. It is best if you have someone come to take you home as it is not safe to drive at this point. 7 Days later I saw Patricia and I was delighted to see she had minimal bruising and swelling and she could already see a marked improvement. I have seen her today and she is delighted with the natural looking change. A feature of upper eyelid surgery is that people often comment how much brighter and better the patient looks but they cannot pinpoint what the change is. I would like to thank Mr Lambe for the success of my recent upper eyelid surgery. From Consultation through to completion of the procedure he was very professional, very reassuring and his friendly manner put me completely at ease throughout the operation. Should I need any further treatment in the future I would certainly consult with Mr Lambe again and would have no hesitation in recommending his services. In general, this is a good indicator of having excellent cosmetic surgery – if friends and acquaintances remark how much better you look, but cannot tell exactly what you have had done! Below are some common FAQ’s about Blepharoplasty surgery. All procedures at Reflect Clinic are unique to you but they are in the region of £2500-£3500. If you need BOTH lower and upper it varies between £3500-£6500. 0% finance is available via Spire Manchester if needed. Please book a Consultation to find out an exact price for your Blepharoplasty (with no hidden extra fees) where you can also be assessed and can discuss your needs with our Expert Surgeon, Mr Gerard Lambe. This is the technical term used by surgeons to describe the operation to remove excess skin. It can usually be done under a local anaesthetic and will take about 45 mins. The wounds are very carefully stitched with a running stitch and this is removed in the clinic by Mr Lambe about 7 days later. This is a procedure to remove excess skin and sometimes fat from the upper eyelid. A number of people as they age notice they develop a tired and drawn look and this can frequently be due to heavy looking upper eyes. Ladies often say that they have to hold their eyebrows up to put eyeshadow on which then gets transferred to the upper part of the eyelid or the makeup is hidden by the skin which hangs over. There is nearly always some bruising for certain on the eyes as they are so very delicate but this does tend to settle pretty quickly and most ladies find that they can cover the worst of it with makeup in about 7 days. For men it means wearing sunglasses to cover up for a few days. No. It is very important in your assessment to assess the position of the eyebrow. The heavy appearance can sometimes be due to the brow having slipped down and not excess skin in the eyelid. A blepharoplasty is the wrong operation for a low brow as it will not correct the problem and could cause a very odd look. A brow lift would then be the correct operation and this is something that can be achieved in many different ways. Botox can be used to lift the brow temporarily but must be repeated. Other ways use incisions in the brow or forehead to achieve a lift or it can form part of a facelift. The scars from a Blepharoplasty are very well concealed in the natural lid crease that we all have and then it is placed into crows feet lines on the outside of the eye. Generally, all wounds are well healed by about 10 days. All surgery carries a degree of risk. Bleeding and bruising are the main issues and rare risks are damage to the muscle that opens the eye. Is it best to remove fat? No. removal of too much fat will produce a hollowed and sunken eye that is not attractive. It also increases the danger of bleeding behind the eye, which is the most serious complication. However, small bits of fat in the corner of the eye can be safely removed and can enhance the overall result. What if I want to be asleep for the procedure?